The Comfort of a Recliner & Realxing Moton of a Glider. Available at Chair Land. The Ultimate Seating and Lumbar Support…at prices $100’s Less than Our Competition. The Dutailier AvantGlide chairs are among the most popular products at Chair Land Furniture Outlet. There’s no doubt that this is due to the Dutailier engineers who are constantly working on improving the design and functionality of AvantGlide recliners. The beautiful AvantGlide gliders combine the best of both worlds: the comfort of a recliner and the relaxing motion of a glider. In the pure Dutailier tradition, the AvantGlide chairs are designed to provide the ultimate seating and lumbar support, making them ideal for reading or watching television. 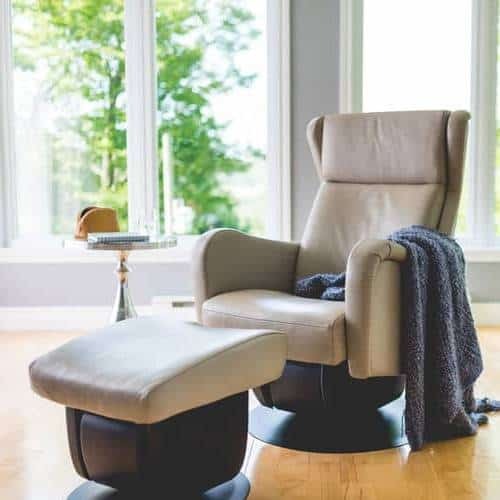 For complete rest and relaxation, an AvantGlide ottoman provides a gliding movement even when the chair is in a reclined position. Interested in having a Dutailier AvantGlide Recliner shipped to your location? We’re proud to offer shipping for AvantGlide recliners anywhere in the Continental US. Our Chair Land Furniture Outlet Showroom has the largest leather recliner inventory in the State of Florida. If you find the same Dutailier AvantGlide Glider advertised at a lower price within 30 days of purchase, we will gladly refund the difference plus $100. This offer does not apply to sales tax.